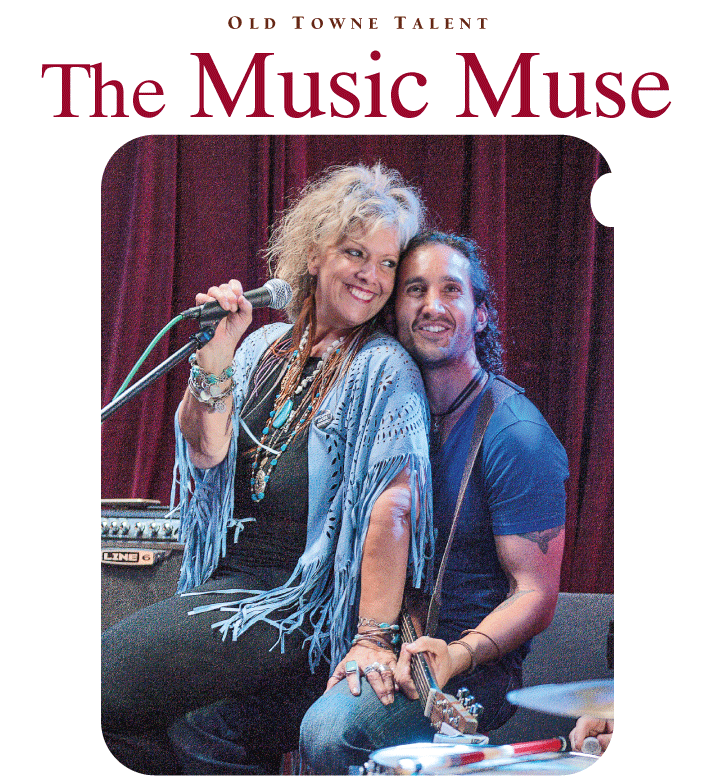 As the Music Muse, Crystal Husband, here with singer-songwriter Emad “Emo” Alaeddin, lines up a variety of mostly local acts to perform at The District Lounge. “It’s given me an opportunity to help a lot of people art-wise and music-wise,” she says. Hair stylist, singer, music promoter—for Crystal Husband, the roles have long been intertwined. When she was a little girl, she did hair and makeup on Barbie dolls and also sang in church. Today, she’s the owner of Crystal’s Hair Studio in Old Towne and organizer of acoustic music concerts at The District Lounge. “Hair has been the income, but music has always been what I love,” she says, quickly adding that she gets “pure joy” from both. Cutting, coloring and styling hair have earned Husband a lot of notice since 1990 when she started in the salon that she bought about seven years later and still works at today. That was true when it was spotted on the big screen in the 1996 Tom Hanks film “That Thing You Do!” about a one-hit wonder band. Ditto when Billy Bob Thornton stopped in while filming part of “The Man Who Wasn’t There,” a 2001 Cohen brothers 1940s crime drama. The scenes done in Orange took place in the winter with snow on the ground, but actually were shot during a much warmer time of the year. Husband enjoyed meeting Christina Applegate and Jennifer Love Hewitt when they were around filming projects. Ben Affleck, not so much. While the A-list stars in the various productions brought in their own hair and makeup specialists, Husband did groom some of the extras, security guards and others. Another longer lasting gig was perming Bill Medley’s hair during the 1980s when the singer/ songwriter for The Righteous Brothers lived in Villa Park. Husband also combined her passions during her late teens when she made regular trips to Los Angeles to do hair and makeup and also found work as a backing vocalist. That would be the Music Muse acoustic sessions, which feature under-recognized talent at The District Lounge. A recent Sunday afternoon featured performances by Joseph Puccio, Frank Cope and Stevie Talks, all from Orange County, and each doing about a 45-minute set. Singer-songwriter Warren Sellers, author of The Journey of a Song: 60’s and 70’s, has known Husband for about five years and says that the Music Muse presentations are important for musicians trying to get noticed. Husband spends several hours each day researching the acts to invite and publicizing the sessions by creating and distributing fliers and also getting the word out via social media. “It’s one of my pastimes,” she says. “I either do hair or Music Muse—the two things in life I do the most besides binge on Netflix and Amazon.